This article is about the heraldic statues. 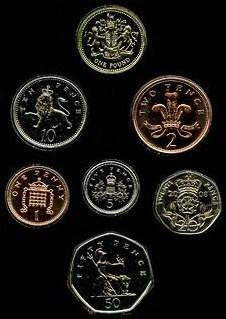 For the coins issued by the Royal Mint, see The Queen's Beasts (coin). The original Queen's Beasts in the Canadian Museum of History. The Queen's Beasts are ten heraldic statues representing the genealogy of Queen Elizabeth II, depicted as the Royal supporters of England. They stood in front of the temporary western annexe to Westminster Abbey for the Queen's coronation in 1953. Each of The Queen's Beasts consists of an heraldic beast supporting a shield bearing a badge or arms of a family associated with the ancestry of Queen Elizabeth II. They were commissioned by the British Ministry of Works from sculptor James Woodford (who was paid the sum of £2,750 for the work). They were uncoloured except for their shields at the coronation. They are now on display in the Canadian Museum of History. There are ten heraldic beasts of a very like sort at Hampton Court Palace near London. They were restored at the beginning of the twentieth century but were derived from originals made more than 400 years ago for Henry VIII, and are generally called 'the King's Beasts'. They are carved in stone and each sits erect, supporting a shield upon which there is a coat of arms or a heraldic badge. From the beasts themselves and the emblems which they carry on their shields it is evident that they stood for King Henry and his third Queen, Jane Seymour. In the autumn of 1952, the Minister of Works, in preparation for the great event some months ahead, called upon the Royal Academician and sculptor James Woodford, OBE, to create ten new beasts similar in form and character to the ten at Hampton Court but more particularly, appropriate to the Queen. 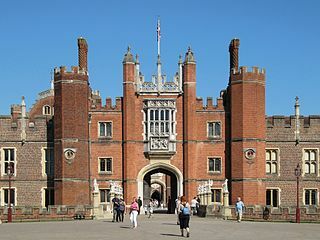 Exact replicas of those at Hampton Court would have been unsuitable for the occasion, for some of them would have little connection with Her Majesty's own family or ancestry. The beasts are some six feet (1.8 m) high and weigh about 700 pounds (320 kg) each. They are works in plaster, and so cannot be left exposed to the elements. Originally uncolored except for their shields, they are now fully painted. The Beasts were on display outside the western annexe of Westminster Abbey. The annexe was a glass-fronted construction in which to marshal the long processions before the service. The statues were placed along the front with the exception of The Lion of England. It was placed in the alcove formed by the North wall of the annex and the entrance used by the Queen to enter the Abbey on her arrival in the Gold State Coach. The statues were placed left to right in the following order when facing the annex from the west: The Lion of England, the greyhound, the yale, the dragon, the horse, the lion of Mortimer, the unicorn, the griffin, the bull, and the falcon. This was not the same order as they are in the royal pedigree, but were ordered in this way for balance and symmetry in display. The Scottish Unicorn, Horse of Hanover, Griffin and Falcon replace four of the Beasts at Hampton Court (Seymour Black Lion, Seymour colour-spotted Panther & Seymour Unicorn & either the so-called Tudor Dragon or the Royal Dragon). After the coronation, they were removed to the Great Hall in Hampton Court Palace. In 1957, they were moved again to St George's Hall, Windsor. The beasts were taken into storage in April 1958 while their future was considered. It was eventually decided to offer them to the Commonwealth governments; Canada, being the senior nation, was offered them first. In June 1959, the Canadian government accepted the beasts and they were shipped there in July. Originally, the only coloured parts of the statues were their heraldic shields; but, for the celebrations of the Centennial of Canadian Confederation in 1967, the statues were painted in their full heraldic colours. They are now in the care of the Canadian Museum of History in Gatineau. In 1958, Sir Henry Ross, Chairman of the Distillers Company in Edinburgh, paid for Portland stone replicas of the statues, which are on display outside the Palm House at Kew Gardens. The beasts also served as models for topiary at Hall Place, Bexley. The original sculptures have been commemorated in the following forms: bone china figurines, cups and saucers, glass tray sets, plaster models, reclaimed material reproductions, porcelain candlesticks, British postage stamps issued in 1998, silver tea spoons, and tea towels. In 2016 the Royal Mint launched a series of ten Queen's Beasts coins, one for each beast. 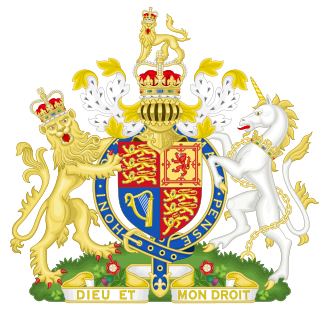 The Lion of England is the crowned golden lion of England, which has been one of the supporters of the Royal Arms since the reign of Edward IV (1461–1483). It supports a shield showing the Arms of the United Kingdom as they have been since Queen Victoria's accession in 1837. 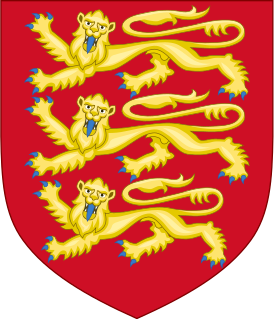 In the first and last quarters of the shield are the lions of England, taken from the arms of Richard I "The Lionheart" (1157–1199). The lion and tressure (armorial border) of Scotland appear in the second, and the harp of Ireland is in the third. The White Greyhound of Richmond was a badge of John of Gaunt, Earl of Richmond, son of Edward III. It was also used by Henry IV and especially by Henry VII. 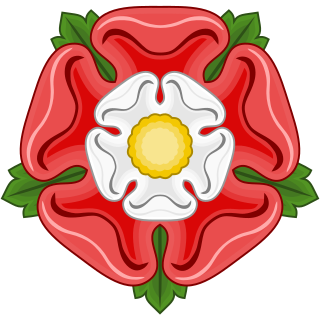 The Tudor double rose can be seen on the shield, one rose within another surmounted by a crown. It symbolizes the union of two of the cadet houses of the Plantagenet - York and Lancaster. The Yale was a mythical beast, supposedly white and covered with gold spots and able to swivel each of its horns independently. It descends to the Queen through Henry VII, who inherited it from his mother, Lady Margaret Beaufort. The shield shows a portcullis surmounted by a royal crown. The portcullis (uncrowned) was a Beaufort badge, but was used both crowned and uncrowned by Henry VII. The red dragon was a badge used by Owen Tudor, after the story of the dragon on Llewelyn the Last's castle grounds. His grandson, Henry VII, took it as a token of his supposed descent from Cadwaladr, the last of the line of Maelgwn. 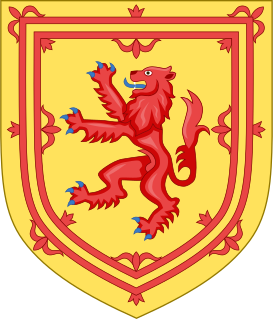 The beast holds a shield bearing a lion in each quarter; this was the coat of arms of Llywelyn ap Gruffudd, the last native Prince of Wales. 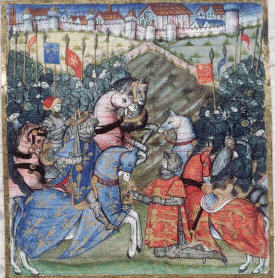 The White Lion of Mortimer descends to the Queen through Edward IV. 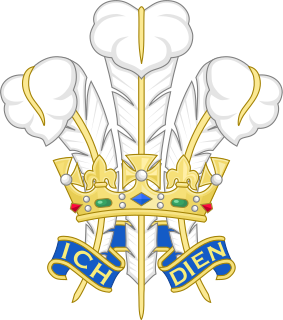 The shield shows a white rose encircled by a golden sun, known heraldically as a ‘white rose en soleil’ which is really a combination of two distinct badges. Both of these appear on the Great Seals of Edward IV and Richard III, and were used by George VI when Duke of York. Unlike the Lion of England, this beast is uncrowned. The griffin of Edward III Queen's Beast is an ancient mythical beast. It was considered a beneficent creature, signifying courage and strength combined with guardianship, vigilance, swiftness and keen vision. It was closely associated with Edward III who engraved it on his private seal. The shield shows the Round Tower of Windsor Castle (where Edward III was born) with the Royal Standard flying from the turret, enclosed by two branches of oak surmounted by the royal crown. The falcon was first used by Edward III of the House of Plantagenet as his badge. It descended to Edward IV, who took it as his personal badge, the falcon being standing within an open fetterlock. Originally closed, the slightly open fetterlock is supposed to refer to the struggle Edward IV had to obtain the throne — "he forced the lock and won the throne." ^ "Elizabeth II". Retrieved 2016-09-11. ^ "Heraldry Projects: Queen's Beasts". www.heraldry.ca. Retrieved 2016-09-11. ^ Parks and Gardens UK (2014-11-01). "More heraldic beasts…". Parks and Gardens UK. Retrieved 2016-09-11. ^ "The Queens Beasts (1998) : Collect GB Stamps". www.collectgbstamps.co.uk. Retrieved 2016-08-17. London, H. Stanford; Bellew, Sir George (1953). The Queen's Beasts (1st ed.). London: Newman Neame. ASIN B00137BAOY. Wikimedia Commons has media related to The Queen's Beasts.